In Prague we documented numerous breeding sites of Buzzard (Buteo buteo), Marsh Harrier (Circus aeruginosus), few nests of Goshawk (Accipiter gentilis) and Honey Buzzard (Pernis apivorus). The most numerous raptors are Kestrels (Falco tinnunculus) followed by Sparrowhawks (Accipiter nisus) whereas the most rare Peregrine Falcon (Falco peregrinus) occupies only one permanent nest. In last decades many breeding sites were reported from large cities of USA and Europe. 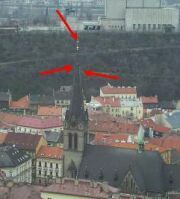 In Prague we discovered the first attempt in 1995. Both breeding birds were ringed the female with two rings and the male with three, but their origin could not be proved. In the first year the female laid eggs in the tower of Tyn cathedral situated in the most central part of town. This brood was abandoned due to reparation works that closed access to breeding cavity. The birds accepted a breeding box build in the same tower and in 1996 they laid four eggs. Four chicks hatched and one chick from captivity was added. All young were marked with color rings and successfully fledged. One chick was later found electrocuted some 60 km north from the nest. If the other offsprings one female was seen in her territory some 120 km north of the city, the outcome of the others is unknown. Next year the same breeding pair laid eggs in the tower of the neighboring St. Jacob's church. Of three fledged chicks, one was shot near the nest with an airgun. Its wing was damaged so it could not be released to wild, but it is still alive (2003) in the captivity. During the winter 1999/2000 the adult female of the pair was found injured. This bird originally escaped from a falconer in 1992 and now returned to him. Unfortunately, she was not released after injury healed. In the spring of 2000 the original male formed a pair with a young, two years old female but did not breed. This female had been raised and ringed at a rock nest in Germany. She bred next year 2001 but with other male. The original male with three rings probably died in the winter 2000/2001 and was substituted by a male that was identified as one of local chicks from 1997(!) - which formed a pair with German-ringed female. From three eggs only one chick hatched therefore one other was added. The entire breeding process was monitored on web page www.rozhlas.cz/sokoli where you can still find more details. Both chicks successfully fledged. Unfortunately next winter the new male again disappeared and in 2002 female remained alone. She was seen, with a slightly hanging right wing after injury, even in winter 2002/2003 but disappeared in the early spring. Is it the end of Prague Peregrines? These observations suggest that there is high frequency of injuries and subsequent mortality in the city. Hunting males are more threatened and therefore missing in the population. This can be perhaps improved by local releasing generally more philopatric males. 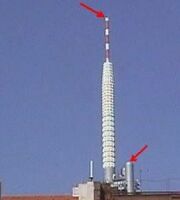 In following years another pair was discovered around the TV tover in Zizkov (Prague 3). Female with rings is keeping this territory. She can be seen mainly on the top of st. Prokopius church. In springs 2005 and 2006 she was fed by unringed male but they did not breed in this place. During winter 2006/2007 only this female was around. RIGHT LEG: LOWER-normal size; UPPER-high black ring. In our case, the male could still wear the breeding ID or another ornithological ring after being captured. Czech ringer Vaclav Bosek caught on 20.2.1993 in Doubravka near Pilsen a peregrine male with three rings: the German ring EA32706, a thin blue ring and a c-ring. Fortunately he made the photo of trapped bird (left). 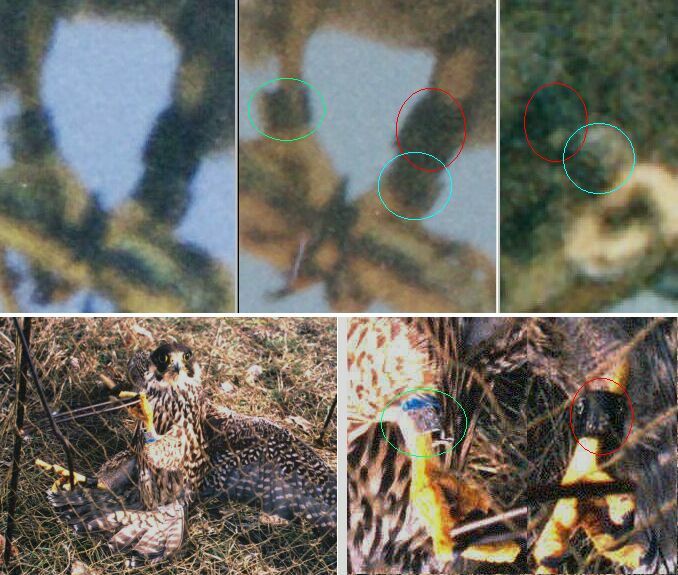 Right picture shows relevant legs with rings in comparable positions. During manipulation a thin blue ring has been broken and another Czech ring was added (N. Museum Praha CB12074) below black c-ring. Thus, we know that the first Prague male was released as young bird from a hacking box ("nest") near Pirna (Germany, close Elbe river, Nazionalpark Sachsische Sweitz) on 18.06.92. This was a very successful release project that restored a peregrine population in south-east Germany and northern Czech Republic. We have more colour ring results that confirm close links between Prague and this polulation.